I have been taking day trips to San Francisco a few times a year for almost my entire life. Throughout childhood, we always spent a day in San Francisco for my birthday, visiting Pier 39, Ghiradelli Square, the Exploratorium, and the San Francisco Zoo. When I had kids, the tradition continued and of course, we took the littles to the same places. But eventually, we got bored of doing the same things and tired of the crowds and I began to research the lesser-known things to do in San Francisco and what others consider the secret San Francisco places of interest. Now I have a giant list of out-of-the-way hidden gems to see and experience, and each time we visit the city, we check a few more off my list. This last weekend in the city began with climbing the gorgeous 288 step Lyon Street Stairs, taking a four mile walk through Crissy Field to Fort Point and back, listening to the Wave Organ in a jetty in the marina, and exploring the Palace of Fine Arts. Fort Point National Historic Site is a three story abandoned military fort sitting directly under the Golden Gate Bridge that at one time boasted 126 cannons, each weighing 10,000 pounds, pointing out of it’s seven foot thick walls ready to defend the San Francisco Bay. A view of Fort Point National Historic Site and the Golden Gate Bridge from Marine Drive in San Francisco. On our various day trips and weekend getaways to San Francisco, I have seen Fort Point, but I never knew the old brick building was Fort Point. Really, I didn’t know what it was and I definitely had no idea that you can go inside, otherwise we would have visited long ago. While there is a parking lot at Fort Point National Historic Site, we didn’t know that at the beginning of our adventure and we weren’t even planning to go there, so we parked near the Marina Green at the other end of Crissy Field. We walked the Crissy Field Promenade, also called the Golden Gate Promenade to the Warming Hut and Torpedo Pier to get photos of the Golden Gate Bridge. There we saw signs for Fort Point and I wanted to go to the base of the bridge anyway, so we kept on walking. Fort Point National Historic Site was amazing. 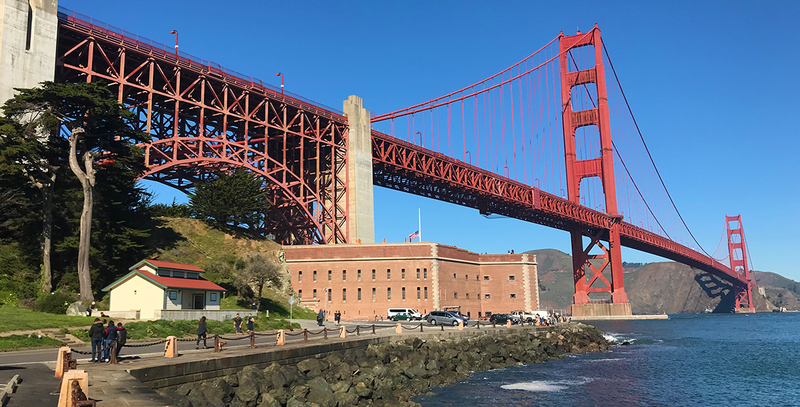 There are museum exhibits on the construction of the Golden Gate Bridge, the Fort Point Lighthouses, Buffalo Soldiers, and the construction of and life at Fort Point. In the theater you can watch two movies on the construction of the Golden gate and life at Fort Point. And, you have access to all three floors of the fort and the roof to explore. We began our self-guided tour on the first floor, checking out the cannons, walking through eerie corridors lined with arched brick casemates for cannons, and browsing some exhibits. Two separate granite spiral staircases caught our attention and then lead us all the way to the roof where we were treated to magnificent views of the Golden Gate Bridge, the San Francisco Skyline, The East Bay and Bay Bridge, Alcatraz and Angel Islands, the Marin Headlands and Point Bonita, and Lands End. It was also quite an experience to stand directly under the Golden Gate. Up next, we walked the entire second and third floors of Fort Point, exploring the museum exhibits, peeking through the cannon openings in the walls that haven’t been closed up, and marveling at the history of the fort. Established in 1853 during the California Gold Rush, Fort Point has stood at the narrows of the Golden Gate for more than 150 years. The three-story brick fortress, built over eight years by more than 200 men, was to be the most formidable deterrence America could offer to a naval attack on California during the Civil War. Called The Pride Of The Pacific, Fort Point is the only brick fortification west of the Mississippi River to use the military’s Third System architecture style, with three stacked levels of cannons. The original point used to be 90 feet higher in elevation! Plans specified that the lowest tier of artillery be as close as possible to water level so cannonballs could ricochet across the water’s surface to hit enemy ships at the waterline, so workers had to blast the 90 foot cliff down to 15 feet above sea level. While its 500 infantry men and 126 cannons never saw battle, the fort has played a significant role in military history and architecture, being repurposed several times over the years. With the rise of more powerful rifled cannons, brick forts like Fort Point became obsolete. In 1886 the troops were withdrawn, and the last cannon were removed about 1900. During World War I, it was remodeled for use as a detention barracks, but never actually used for that purpose. In the 1920s, the Presidio assumed control of the property and used it to house unmarried officers and military trade schools. Between 1933 and 1937 the fort was used as a base of operations for the construction of the Golden Gate Bridge. Construction plans called for the demolition of Fort Point, but Chief Engineer Joseph Strauss adjusted the design to create a special arch that would save the fort and allow the bridge to be built directly over it. During World War II, approximately 100 soldiers were once again stationed at Fort Point, manning searchlights and rapid-fire cannons atop Fort Point to guard the bay from submarine attack. The Fort Point Museum Association was created in 1959 by a group of retired military officers and civilian engineers. They fought to make Fort Point a National Historic Site and in 1970 achieved their goal. Today Fort Point National Historic Site is administered by the National Park Service as a unit of the Golden Gate National Recreation Area. San Francisco was occupied by Spain in 1769 and by 1776 established the first European settlement with a mission and a presidio. Spain fortified the cliff where Fort Point now sits and built the adobe Castillo de San Joaquin in 1794, to house around 10 cannons. In 1821, when Mexico won independence from Spain, it gained control of the region and the fort, but eventually the Mexican army relocated to Sonoma and the structure was abandoned. In 1846 during the Mexican-American War, US forces captured and occupied the empty castillo and disabled the cannons. In 1933, Fort Point was designated a California Historical Landmark under the site’s original name, Castillo De San Joaquín. Fort Point Light, in operation from 1864 until 1934, is a decommissioned lighthouse built on the roof of San Francisco’s Fort Point. It is the third lighthouse built on the point and it still stands today. The first lighthouse was built in 1853 in the Cape Cod style. It was the second lighthouse built on the west coast of the United States, but stood for only three months. While waiting for the arrival of its light, it was torn down to make room for the construction of Fort Point. The second lighthouse, built between the fort and the water, was lit in 1855. Over time, the foundation suffered from erosion and it was torn down in 1863 to make room for a larger seawall. The third lighthouse, Fort Point Light, was built on top of the fort in 1864. It is a 27 foot tower with an iron spiral staircase. Its fourth-order lens produced alternating white and red flashes. In 1934, the lighthouse was decommissioned because the new Golden Gate Bridge blocked most of its light from mariners. Fort Point National Historic Site is located at the south anchorage of the Golden Gate Bridge at the end of Marine Drive, San Francisco, California 94129 in the Presidio. Open Friday through Sunday from 10:00 am to 5:00 pm. Closed on Thanksgiving, Christmas, and New Year’s Day. You can take a self-guided tour any time and guided tours are offered periodically. Two movies on the construction of the Golden Gate and the history of Fort Point are shown in the theater across from the bookstore. Museum exhibits are found throughout the fort on the construction of the Golden Gate Bridge, the Fort Point Lighthouses, Buffalo Soldiers, and the construction of and life at Fort Point. Only the first floor of Fort Point is accessible. This includes the bookstore, theater, cannons, and some exhibits. Restrooms are available outside the Fort. They are located approximately 100 yards away from the fort, down the main road on the right side. Dogs are not allowed inside Fort Point, but are allowed on leash on the outer grounds.